American Future Fund's new attack ad against Reps. Bruce Baley (D-IA) and Dave Loebsack (D-IA) uses a vote to adjourn the House to suggest that they oppose "stopping a huge tax hike for Iowa families." The ad pushes the misleading claim that the "biggest tax hike in history [is] looming," and falsely suggests that health care reform is responsible for "trillions we can't afford." In reality, congressional Democrats agree that tax cuts for the middle class should be extended and, despite the ad's attempt to link health care reform to "millions in job-killing taxes," the Affordable Care Act will create millions of jobs and reduce the deficit. American Future Fund: "Home Sweet Home"
Home sweet home. It's where you go after a hard day's work. Or for Bruce Braley and Dave Loebsack, where they run, instead of doing their jobs. 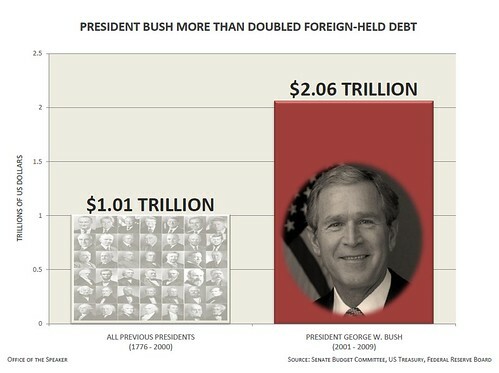 Braley and Loebsack voted for trillions we can't afford and millions in job-killing taxes. And with the biggest tax hike in history looming, Braley and Loebsack voted to go home instead of stopping a huge tax hike for Iowa families. Maybe we should just send them home — for good. American Future Fund is responsible for the content of this advertising. 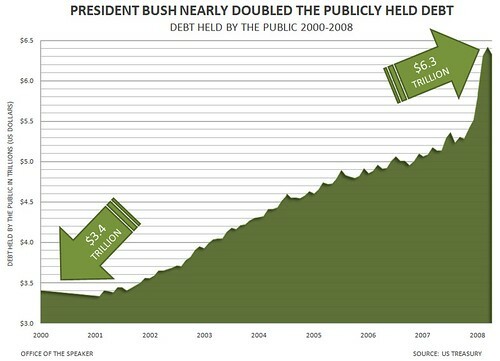 Allowing The Bush Tax Cuts To Expire Would Not Be "Biggest Tax Hike In History"
Do Democrats want every tax bracket to rise, as Pence suggests? In a word, no. Pence is right that every tax bracket will go up if the law is not extended. Still, we think the claim that Democrats don't want to extend the law is inaccurate. 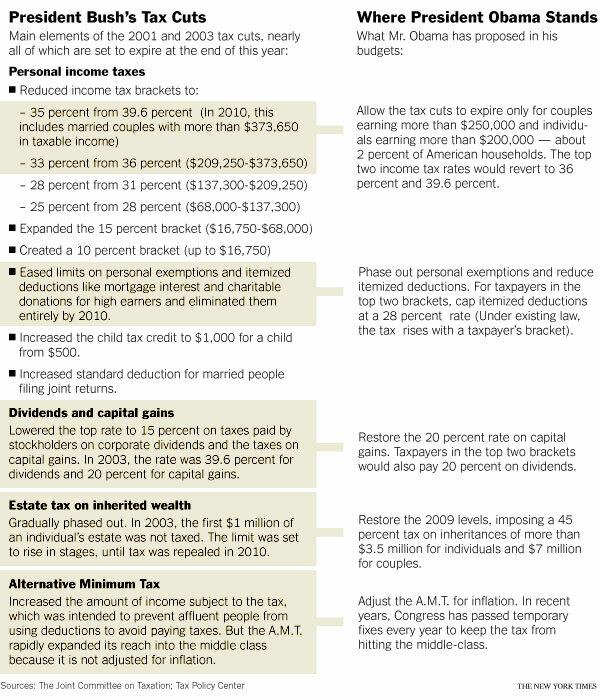 While the legislative drafting is still in process, the Democratic majority in Congress has made clear that it plans to extend tax cuts for all but the top couple percentage points of the income distribution. So it's highly misleading for him to say that Democrats actually want to see all the bill's cuts expire. Indeed, Pence's comment verges on a scare tactic. The White House and congressional Democrats conceded Sunday that they will probably wait until after the Nov. 2 elections to vote on a plan to prevent tax rates from rising next year for the vast majority of Americans. Republicans would not compromise on any of the issues over the past two weeks and attacked Democrats for ending the session without voting on the tax cuts. House Republicans even tried to block the formal resolution that allows the chamber to adjourn, leading to an unusual 210-209 vote in which 39 Democrats joined nearly all the Republicans in opposition. The ad cites the House vote on the Affordable Care Act to contend that health care reform is responsible for "trillions we can't afford and millions in job-killing taxes." In fact, the Affordable Care Act will reduce the deficit and create millions of American jobs — including over 3,000 in Iowa. 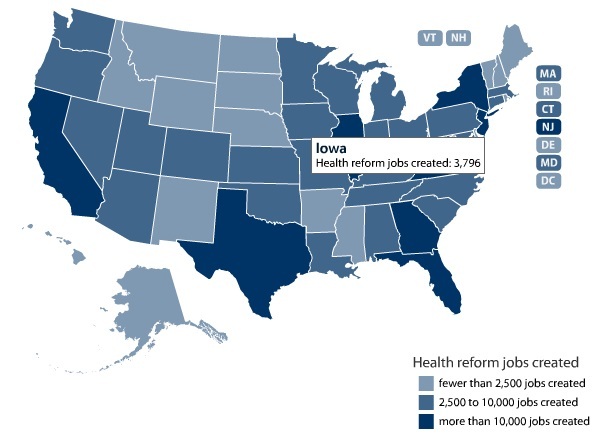 Health Care Reform Would Create Over 3,000 Jobs In Iowa. According to the Center for American Progress, "the reduction in health insurance premiums caused by health care reform would create" up to 3,796 jobs in Iowa.